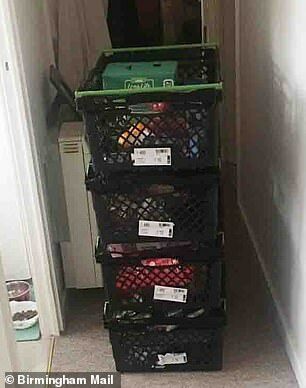 A disabled woman was left barricaded in her living room for two hours when an Asda delivery driver dumped crates of shopping in her hallway. Anna O’Mara, who can barely walk, ordered a shopping delivery worth £80 to her Wolverhampton home. But the 48-year-old was left trapped in the living room of her ground-floor flat – unable to even use her toilet – after the driver ditched the heavy crates full of food in her hall and scarpered. Outraged Anna eventually managed to alert her daughter who travelled from Birmingham to help. Now Asda has admitted its worker ‘clearly got it wrong’ and offered its ‘full apologies’. Anna told Birmingham Live: ‘Asda need to be disabled-friendly. I was left paralysed for four weeks when I tripped over in my bedroom and broke my back, at the start of June. ‘I only came out of hospital last month and as I can’t go out on my own, I chose to do my food shopping online. ‘I had one delivery from Asda which was great, the driver brought my shopping in and even put it away for me. ‘But the second time was horrendous and degrading.’ Anna ordered her shopping to be delivered between noon and 1pm on September 6. When the driver arrived five minutes late, she asked him to unload the shopping into her kitchen. She said: ‘The driver said “it’s not my job to unpack” and, despite me telling him I could hardly move, he dumped the crates in the hallway. ‘I told him I had to walk with a frame and I wouldn’t be able to get past them, but he just left. He was clearly in a rush. ‘I couldn’t lift them or move them out of the way. I couldn’t get past to leave my living room – I couldn’t even get to the loo. Anna, who now has to walk with a frame, said the incident was a ‘real shock’. ‘My life has changed dramatically in the last few months,’ she said. ‘I have gone from working full-time, being a totally independent and able-bodied person, to not working and having to rely on others for help. ‘But out of everything I have been through, this came as the biggest shock. ‘I can’t be Asda’s only disabled shopper. I chose to do my shopping online as I thought it would be convenient, but I was left feeling angry and embarrassed. ‘They are a major retailer. I want them to be aware they can’t treat people like this.